Minnesota Rising: 2010 Census: Make Sure You Count! 2010 Census: Make Sure You Count! It's Census Day! Have your turned in your 2010 Census form? 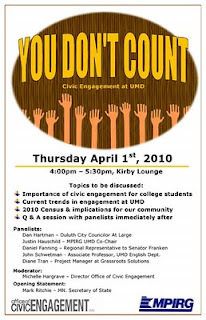 As part of efforts by the Office of Civic Engagement at the University of Minnesota - Duluth (UMD), I'm excited to take part in a panel discussion later today entitled, "You Don't Count." 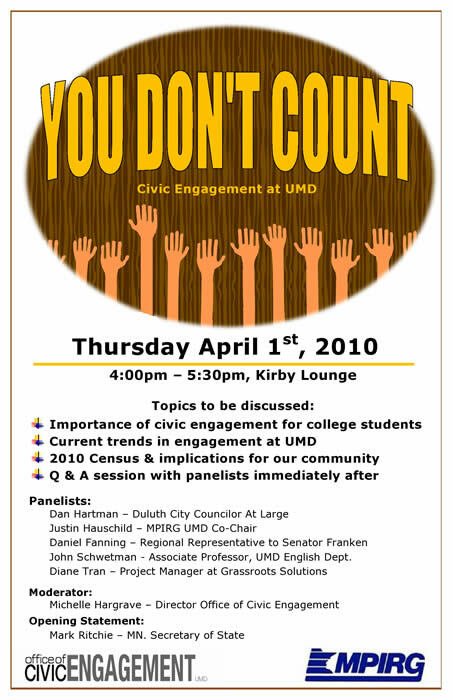 The discussion will center around the importance of civic engagement for college students, current trends in engagement at UMD, and the implications of the 2010 Census in our state and community. If you're up north, feel free to stop by the Kirby Lounge to participate in this educational and engaging conversation!